We offer an extensive line of acrylic, spun aluminum, and stainless steel chilling buckets and bowls, produced by the leading European manufacturers of these items. Conforming to European Union health standards for the professional food service industry, all are made from high quality raw materials that have not been used in other products. 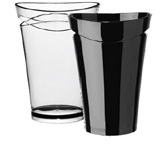 Acrylic buckets and bowls are available in clear or transparent colors as well as solid colors like black or white. Many feature thick walls that hold up to the day to day use in restaurants and wine bars while offering crystal clear transparency at a fraction of the weight and cost of glass or crystal. Personalization is available by pad printing in multiple colors. 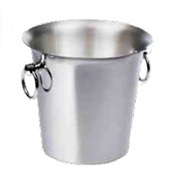 Aluminum or stainless steel buckets and bowls come in a variety of surface finishes. This includes shiny or brushed silver, as well as a wide variety of colored enamel finishes that are baked on for long life. Laser engraving, stamping, and multiple color serigraph imprinting are available for personalization on one or two sides for all items. Pre-production samples for client approval are available, as are digital images showing the size and position of imprinting. The minimum quantity that can be ordered for both acrylic and metal buckets and bowls is 300 pieces.